The sugo was her one pot wonder serving as the rich condiment to toss the pasta through for our primo piatto, as well as providing the tender portion of meat for our secondo. The sauce was either flavoured with polpette (meatballs) or ossobuco and sometimes pork, rabbit or quail depending on the season. Many times the pasta and meat came together in one serving as we preferred. I thank my grandmothers for these traditions, and even though they were from the same region of Basilicata, they came from different townships and had their particular specialty when it came to pasta making. Mamma learnt to make pasta from both these women, so I will be dedicating some time to adding pasta dishes to the blog and sharing with you the process of making distinctive shapes that mamma has in turn taught me. Italians do love to give quite descriptive names to their pasta shapes and it appears that each region has their own name for the same pasta type. Many would know le orecchiette (little ears), traditionally made by hand and nowadays also sold as dried store-bought pasta. Though orecchiette pasta is more closely associated with the Puglia region of Italy and cooked with cime di rapa (broccoli rabe), this pasta shape goes by different names depending on where it is made. In Basilicata, Campania and Molise they are also known by their dialect name of ‘recchietelle’, in Abruzzo they are known as 'orecchie di prete' (priest's ears) and orecchini in Lazio. Le orecchiette whose size is diminutive is joined by its bigger cousin, ‘tapparelle’ - slang for big ears and three times the size. The photo below shows the traditional little ears I made and the next size up; still considered small in comparison to tapparelle and the perfect size for a meat sauce to be mixed through. This pasta shape may appear challenging to make, however it is one that can easily be mastered with a little practice. In fact from the first one formed to the last, you will begin to see your skills improve, but then what can be more characteristic than some imperfections; the reality is that no two ears are ever alike, not even when they belong to the rightful owner! Mamma though, a trained seamstress has always been a perfectionist and fascinates me in the precision in which she makes her orecchiette. She never owned a pasta machine until later in time, so perfected her skills in making these special pasta types. I've spent some time with her sharpening my skills in making orecchiette, cavatelli and fusilli (also known as ferricelli); like her I have found pasta making so therapeutic and so much fun especially when a few of us gather together. Papa` as usual lends a helping hand and loves to be amongst it all entertaining us with his crafty comments. With tongue in cheek he would declare: ‘Eh, altro che orecchiette! Implying that they are quite large and no way little as the name suggests; and then with great timing the analogies creep in and he exclaims: ‘mi fischia l’orecchio, qualcuno mi nomina!’ – an Italian saying literally translating as (my ear is ringing, someone is talking about me); an interesting concept also believed to be connected with the evil eye and disfavour. So my friends beware, if your left ear is ringing as opposed to the right, someone is surely talking bad about you and you are advised to bite your finger so that the perpetrator will bite their tongue! Now enough with the ear fallacies and as my father would exclaim: Quando si mangia?! (when do we eat?!) But before I boil the water and take you through the making of this fresh pasta that is carved with a knife and then turned and cupped like ears - thus its name, a bit about the dishes my fellow bloggers will be sharing. Throughout this month we have decided to schedule in some fun and will be posting about foods Italians have for some reason or another named after or make references to body parts; some names are quite amusing while others are a little cheeky to say the least. Francesca will tantalise your taste buds with Saltimbocca alla Romana, and as the name suggests, these pieces of veal are so delicious that they’ll just jump into your mouth; Daniela will explore a Ligurian dish with baccala` and potatoes called Brandacujun – a name composed of the words brandare (to shake or toss) and cujun (testicles) …will leave that to your imaginations!!! Rosemarie is making a pasta dish also from Liguria shaped like tummies and called Pansotti filled with a mixture of parboiled wild herbs; Marialuisa will create a Sicilian sweet shaped and named after the breasts of the patron saint of Catania in Sicily called Minne di Sant'Agata; and Flavia is baking some well known Italian cookies called Lingue di Gatto whose shape happens to resemble a cats tongue. Traditionally the dough for orecchiette uses semola, coarse flour made with durum wheat. Durum meaning hard, has high gluten content and is considered the fundamental ingredient in pasta making when not using eggs and therefore take a little longer to cook through. 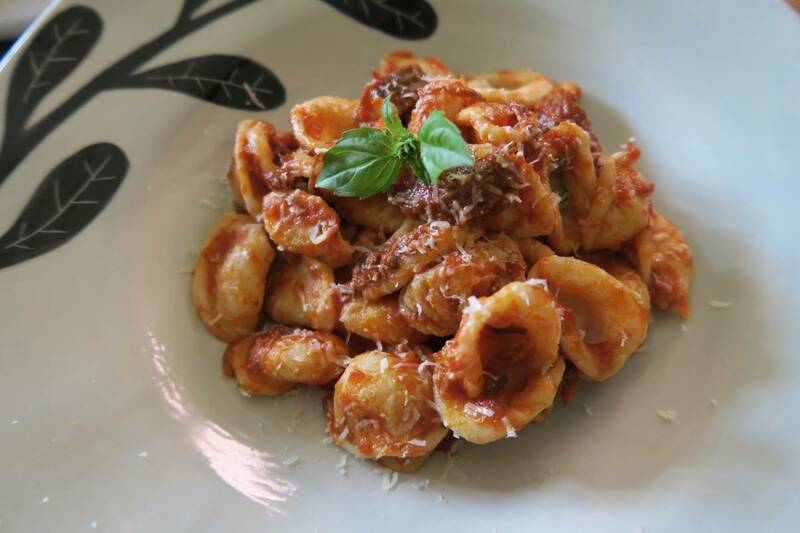 In the Basilicata region where my parents are from this pasta shape is served with either a meat based or a simple tomato sauce spiced up with peperoncini forti (chilli). The orecchiette I share here have been made the next size up as they will be served with a beef ragu` sauce, allowing each orecchietta to randomly fill up with pieces of meat, and of course a good grating of pecorino cheese on top. Like most homemade pasta, the orecchiette dough begins with a well. I like to use a large bowl for this step to ensure no liquid escapes. Mix the two flours and salt together and create a well in the centre. Gradually add the warm water while working in the flour with your fingers or a fork. The warm water will help develop the gluten in the flour making it very elastic. Add enough water to ensure that the dough is soft and workable but not gooey. After the dough is mixed, it needs at least 10 minutes of serious kneading on a lightly floured surface until the dough is very smooth and firm. Roll the dough into a ball and cover in plastic wrap to allow for resting for 1 hour. Shaping the orecchiette is now the fun part. Dust the work surface with the semolina flour and cut off a thin strip of dough. Using your hands gently roll this strip into a long, thin sausage about 2 cm in diameter for the medium sized orecchiette. Then cut the strips into 2 cm long pellets – each of these pieces will be formed into an orecchietta. The individually cut piece is then dragged on a board towards you with a knife, and then turned out over the thumb. The roughness on the dome of the orecchiette which is quite characteristic of this shape is created when the knife glides over the pasta dough before being turned out. The pasta can be cooked immediately or air dried and frozen for future meals when one is time poor. Below is a visual representation of the steps involved in forming the orecchiette. A short clip of this process is found on my Instagram account. I hope you enjoy making these 'recchietelle’ aka orecchiette, and there will be more posts following dedicated to pasta making at The Heirloom Chronicles so stay tuned. Buon Appetito! So that's how they get that rough surface! Wow! Your video on Instagram was really helpful Carmen. I'd always been a bit intimidated by the thought of making these but I'll definitely give them a go one day now thanks to your clip. wow, sembra così facile, grazie per il video. Adoro le orecchiette. And I know the feeling when on Sunday morning I woke up with the ragù aromas in the air, and my mother was making home made pasta such us tagliatelle or Lasagne, and next to the sugo pot there was the coffee machine... wonderful memories. I would like to do the same with my kids. But sometime I'm very lazy on Sunday morning.